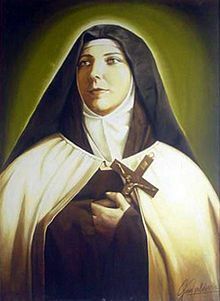 St Teresa was born into a fairly wealthy family in Santiago, Chile. She was an active and vibrant girl engaging in sports and the community. However, like many other Saints, her First Holy Communion day was uniquely special when Jesus spoke to her, something she assumed he did to everyone. At 15, St Teresa wrote to her sister saying, “How happy I am, my dear sister! I’ve been captured in the loving nets of The Divine Fisherman. I wish I could make you understand this happiness”. St Teresa planned to become a nun and at 19, was accepted into the Discalced Carmelite Order. Unfortunately, after only a few months she caught typhus and her health quickly deteriorated. She was allowed to complete her vows early and, following great suffering, she died a few months short of her twentieth birthday. St Teresa’s Feast Day is 12th April. She is the Patron Saint of illness, young people, Santiago and Los Andes. Pray for us that we will humbly accept our suffering as a manifestation of our love for Jesus.